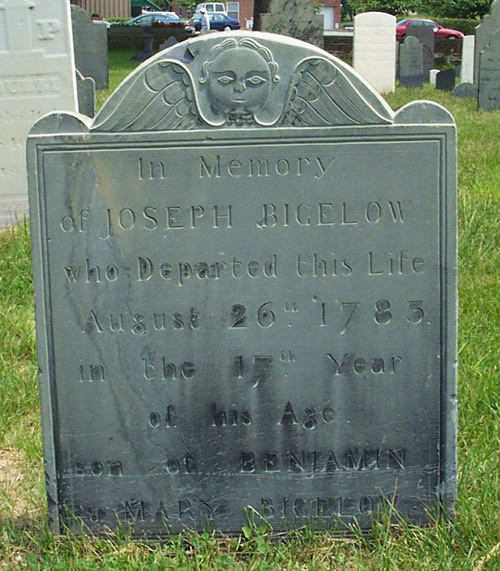 16C1 Benjamin 4 BIGELOW, oldest son of Eleazer 3( Joshua2, John1), and Mary (FISKE) BIGELOW, was born in Watertown, Middlesex county, MA on 13 Oct 1725. As a youth, he moved to Westminister with his parents. In the third division of land in that town he had Lot No.6, 62 acres. He was married 13 June 1751 to Mary WYMAN, the marriage recorded at both Woburn and Cambridge. In 1762 Benjamin received land from his father Eleazer by will, but afterwards moved to Portsmouth, NH. He was one of the principal taxpayers of Portsmouth in 1770. He was deceased before 1790, as he does not appear in the first U.S. census. 16C11.+ Benjamin jr , b ____ ; d _____ ; in business in Portsmouth, NH in 1798, and head-of-family 1790 through 1810; after which his widow Salome is listed as head-of-family. He left issue, two sons and a daughter identified by church records. 16C12. ?Ruth, b ____ ; d _____ ; m 06 Apr 1775 Portsmouth, NH) William McINTIRE. 16C13. Sarah, bapt 16 Jan 1757 Brookline, MA, "daughter of Benjamin." Newbury, and in 1774 was awarded to Thomas Hulme of Boston, as a result of a lawsuit. at Canoe Bridge. Bigelow transferred the property to his son Benjamin jr in 1787.